Eggs always go on sale in the weeks before Easter. Here's a recipe originally from Jonni McCoy's Miserly Meals. 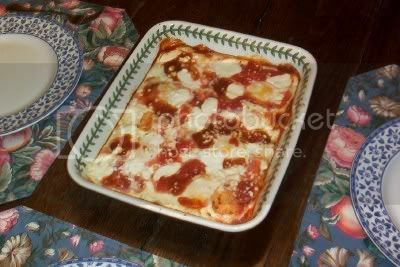 I think she calls it Egg Pizza, but the protein layer of egg whites bakes into soft curds much more like Egg Lasagna. It takes all of five minutes to assemble and only 20 to bake--truly a last minute meal to pair with a salad or wilted spinach. My husband ate 3/4ths of the dish the first time I made it. Grease an 8x8 dish with olive oil. Pour half of the tomato sauce evenly across the bottom of the pan. Sprinkle the Italian Seasoning, garlic powder, onion powder, salt and pepper over sauce. Carefully place the eggs on the tomato sauce to cover. Pour the other half of the sauce over the eggs. Sprinkle the cheese over all. Bake at 350 degrees for 20-25 minutes. If you overbake, the egg whites toughen. May I ask what you do with the yokes of the dozen eggs? Do you save them for something (and what? ), or do you just pitch them? I avoid making a white cake for this very reason... I don't know what to do with the yokes and it feels wasteful to throw them away. I always like looking at your dishes and placemats. Where do you find so many pretty things? Are a lot of them wedding gifts? Oh dear. It tasted good to me ( just like the insides of lasagna only without the noodles ) but my family voted NEVER AGAIN, pleeeeeeeeze. The white curds were too much I guess.